In the last decade, no category of roofing has changed more than metal roofing systems. Today, there are a variety of metal roofing colors, materials and installation techniques that allow for a range of styles and many benefits. In North Dallas, we are starting to see metal replace asphalt shingles, as homeowners and businesses realize the cost, protection against hail and energy savings make metal a wise investment. Not every contractor is skilled to handle metal roofs. Most roofing companies install asphalt shingles 365 days a year. Metal requires experience and special tools to cut and sometimes shape for curved features. Poorly installed metal roofs will leak and won’t be covered in a manufacturer's warranty or insurance claim. At Title, our crew is skilled in all types of metal roofs and we specialize in custom and complex metal projects. The most basic metal for roofing is galvanized steel with zinc coating, to prevent corrosion. Galvanized aluminum is also popular, although it carries a higher cost and the extra rust protection, isn’t necessary in a Dallas climate. Both of these materials are often pre-painted or granular baked and come in a variety of color options. Stone-coated steel protects the metal from rust, while looking the least like a metal roof. It is more expensive than galvanized metal roofing, but mimics traditional roofing materials such as wood, clay tile, asphalt shingles, even slate. The most expensive metal materials are pure zinc and copper, which are chosen for their stately beauty. Title Roofing can create copper roofing sections for bay windows, eaves or shingle a front facade for extra curb appeal. Corrugated metal roof systems are installed in panels, making them cheap in material and labor cost. Great for park shelters, barns, and a variety of commercial buildings, corrugated systems are less common on homes. Their rough appearance can be a turnoff, although the cost of corrugated is most comparable to asphalt shingles. Standing seam metal roofs are most popular for residential and high end commercial projects. While corrugated roofs have exposed fasteners, standing seam provides extra protection between vertical panels. It is therefore better against hail and water leaks. 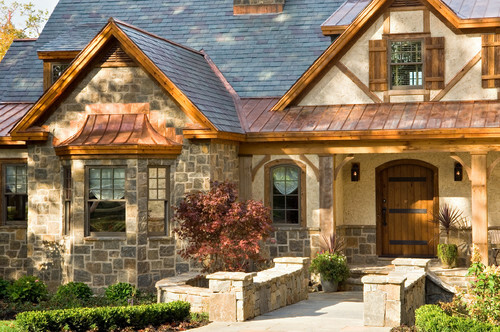 Metal can also be shingled, for a more traditional look. Shingles interlock, withstanding high wind and hail. Metal roofs can also look like wood shakes and even terracotta tiles. One of biggest benefits in a hot climate is a cooler roof, which can have a significant impact on energy bills for Dallas residents. According to the Cool Metal Roofing Coalition, highly reflective metal roofs can deliver energy savings up to 40%. Metal roofs also have minimal to no maintenance. Compared to an asphalt roof, metal doesn’t need to be cleaned, or scrubbed of algae/mold. Metal roofs rarely need repaired after high winds or hail. Most metal materials are rated Class A for fire and Class 4 for hail damage. Many metal roofs are easy to install and when re-roofing, the new roof can be attached on top of asphalt shingles. For the average home, Title has installed galvanized roofs in less than a day! A final benefit is longevity. Metal roofs often outlive the homeowner, lasting 40 - 70 years. Some manufacturers provide lifetime warranties that can even be sold to future buyers. Considering that North Dallas real estate is competitive, a metal roof can greatly improve home equity. Title Roofing & Construction brings twenty years of experience along with unmatched craftsmanship and customer service to North Dallas residents and businesses. © 2016 Title Roofing. All rights reserved.